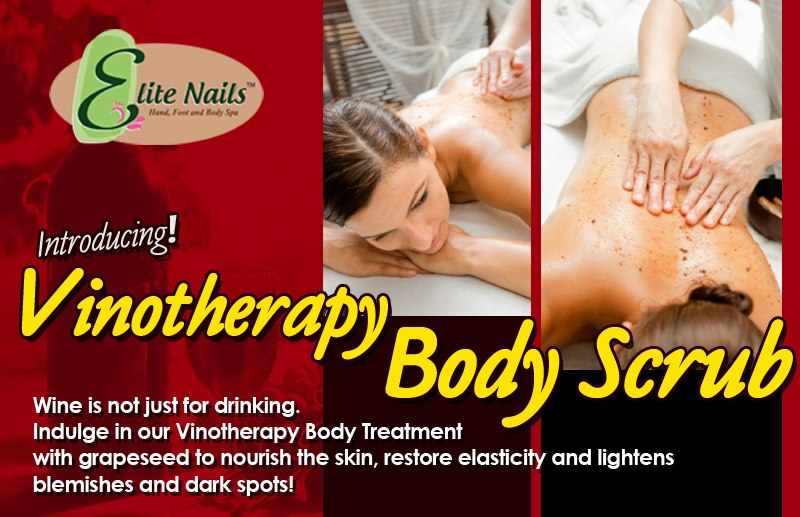 Elite Nails Hand, Foot and Body Spa: Introducing a lovely indulgence: Vinotherapy Body Scrub! Introducing a lovely indulgence: Vinotherapy Body Scrub! What is Valentines without the sensual spirit to go with it? Bland, we know. Elite Nails’ new spa offering seeks to chill out any love month woes with the special treatment called the Vinotherapy Body Scrub. Ideal for couples or even for personal indulgence, the vinotherapy is guaranteed to spruce up your day, and that becomes the real toast of the love season. Vinotherapy is a beauty therapy process using wine grapes. Wine therapy is the latest discovery in the field of aesthetics and well-being. The therapy exploits the benefits of grape marc (the remains after the juice is pressed out to create wine), grape must, grape seeds and wine. Research shows that grape seeds, stems and skins contain antioxidants called polyphenols, which are 10,000 times stronger and 50 times more healing than Vitamin E, while the grape-seed oil, is high in oligomeric proanthoscyanidins (PCO), another powerful antioxidant which can greatly reduce the damage created by free radicals, strengthen and repair connective tissue and promote enzyme activity at the skin cell level. From above read, we can only guarantee positive effects of the vinotherapy and it does only amazing things for our skin and body. 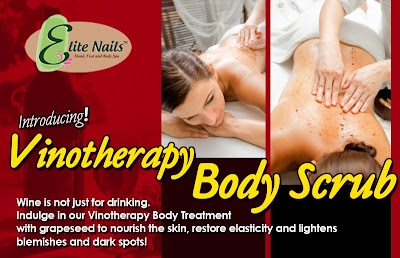 With Elite Nails’ Vinotherapy body scrub, customer will enjoy sipping our on-the-house wine before we lather your skin with the luxurious wine scrub, bath and massage. Our scrub uses a base of nourishing grape-seed, honey, brown sugar and essential oils to regain your skin’s radiance and softness, followed by Elite Nails’ signature massage to relieve tension and enlivens you up. This treatment leaves your skin refreshed and feeling clean, refined and perfectly smooth. This exfoliating, moisturizing and replenishing body scrub packed not only an anti-oxidant punch but a whole new experience perfect for the season. Don’t miss a chance on this one-of-a-kind spa indulgence, spend the love month with your special someone and be sure to try vinotherapy as its one infusion sure to stir up your Valentines.